What Is My Car’s Value? Many factors must be weighed when deciding what to do with your old car. Trade-In? Auction? Private Sale? The number one reason owners choose to sell their cars themselves is that this is often where the greatest return on their investment will be made. Dealers and Auctions will take the largest percentage out of the sale of your car and your car is only worth so much. The first step in selling your used car is determining what it is worth. One resource to help you determine this most necessary piece of information is finding a “buy my car” service. Knowing the true value of your vehicle is your strongest tool when negotiating the sale. Where Do I Sell My Car? Online markets offer far more customer potential than traditional print advertising. Buyers are becoming more market savvy and sellers must utilize the best markets. Buyers are not only market educated today but also more product knowledgeable. You can be certain that if you miss a piece of information in your private sale listing, a curious buyer will surely ask for it. Fortunately, sellers can find many resources to help with their upcoming car sale. Many websites today have predetermined selections that allow you to enter all the important features of your car that will let any potential buyer know exactly what you are offering. This is important to help minimize phone calls and unnecessary enquiries. More importantly, this also helps a buyer feel more confident about your offering. Selling your Used Car is becoming an increasingly engrossing process. 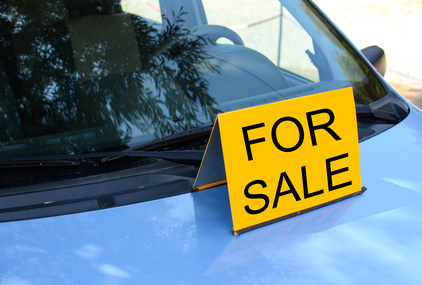 Required state documents can be costly for sellers if overlooked, such as failing to clearly display a Queensland Safety Certificate on a private sale passenger vehicle; this oversight can result in an instant fine of $550. A seller failing to deliver the Vehicle Transfer Notification of Change of Ownership form to the Department for Planning and Infrastructure within 7 days of a sale can result in a $100 fine. Seller responsibilities vary from state to state. Do your research into what your state requires of sellers. Buyers look for cars that have all the necessary documentation. This helps ensure that a buyer is getting a safe car and a good value. Many certificates have expiry dates that a seller must consider. If the buyer wants one, a roadworthiness certificate must be dated within 42 days before the sale of a vehicle. Licence Transfers are required within 14 days of a sale and although the responsibility of the buyer, sellers are wise to do their part in submitting this form. Having all of your documentation current and available will help close a sale. How Do I Avoid Scammers and Fraudsters? Selling through trusted Markets is essential for sellers. Many phishing scams have lured used car buyers and sellers into identity theft. To help avoid scams, be sure you do not share more private information than necessary. Keep your credit card information safe. A free website will never ask for your credit card information. Be sure to know what icons to look for in your Browser, such as a key or padlock to ensure you are on a secured site. Again, providing as much information as possible about your car in your advertisement will help avoid unnecessary contact. Try to give only one contact number or email. Avoid electronic transfers but if necessary ask your bank for the latest advice on secure funds transfers. Once you determine your preferred method of payment, let your potential buyers know and stick to it. Have the buyer meet your payment requirements, don’t bend and use theirs. Being prepared for any possible problems when scouting for a buyer is necessary to avoid any potential liability as a seller. Whether a mechanical failure immediately after you post your vehicle for sale or a mishap during a test drive, it is best to be prepared for such a scenario before putting your car on the market. Check to make sure you are not putting yourself into a vulnerable position. Be sure to know the true state of your car’s condition and take all precautions necessary when making your car available for test-driving. Be sure that you and your buyer have current insurance documentation.